Outdoor wicker is a man-made fiber wrapped around an aluminum wire. The favorite spot for outdoor wicker is a screened in porch. 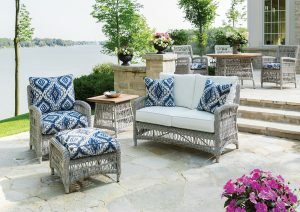 Between the wicker and a good acrylic fabric cushion, getting rained on is no problem. The Lloyd Flanders line of all-weather wicker is the best industry. They have a huge selection of chair, rocker, sofa and loveseat styles. Their coordinated fabric groupings are fabulous and exclusive to them. Time and again we see reluctant husbands come in to our store, dreading their wives wanting to get some dainty, uncomfortable, brittle wicker set. Fear not men! Lloyd is beefy with a welded aluminum frame, deep seat cushions, wide arms and sofas long enough to stretch out on. Sturdy and all American made.